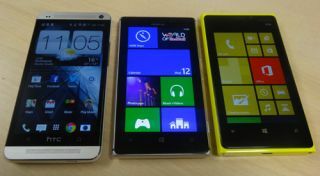 Nokia Lumia 925 vs Nokia Lumia 920 vs HTC One | What Hi-Fi? In this video we take a look at the new flagship phone from Nokia, the Nokia Lumia 925. The Nokia Lumia 925 replaces the Lumia 920 as the top dog in Nokia's line-up, so we thought we'd compare the two – and bring our favourite phone, the HTC One, in to the video for good measure. The Lumia 925 sports a new metal trim, looks to major on camera performance, particularly in low-light scenes, thanks to the addition of a sixth lens. The 925 has a 4.5in AMOLED screen (the 920 was an IPS) with a 1280 x 768 resolution, a 1.5 GHz dual core Snapdragon processor and a PureView 8.7 MP main camera. Inside is 1GB RAM and 16GB or 32GB of storage. Also new is a Smart Camera app, with a host of new features, which is set to roll out to other Windows Phone 8 Lumia devices later this month. Missing from the 925 compared to the 920 is wireless charging out of the box – you'll have to add a wireless charging accessory.